Admission E*Kits: Medline Is A Leading Manufacturer Of Plastic Patient Utensils. When Using Our Components In Your E*Kit You Are Providing Quality And Comfort For Your Patients, Convenience For The Clinical Staff And Cost-Effective Solutions For Your Hospital. 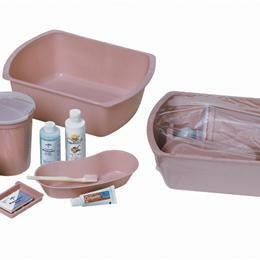 1 Washbasin, Rectangular, Copolymer, Mauve, 6 Qt; 1 Emesis Basin, Mauve, 500 Ml; 1 Pitcher With Clear Lid, Mauve, 1,000Cc; 1 Tumbler, Mauve, 10 Oz; 1 Soap Dish With Ridges, Mauve (Clips Onto Washbasin); 1 Soap, Medline, Deodorant Bar, .75 Oz; 1 Lotion, Medline, 4 Oz; 1 Toothbrush, Individually Wrapped, 30 Tuft; 1 Toothpaste, Colgate, Unboxed, .85 Oz; 1 Mouthwash, Fresh & Kleen, Non-Alcohol, 4 Oz.